Kid Konnection: Grossology...things that make you say ugh! While driving, I happened to listen to the John Tesh show on the radio about a new genre in children’s literature that is aimed specifically at reluctant boy readers—grossology. Hence, books like Captain Underpants resonate with this audience. 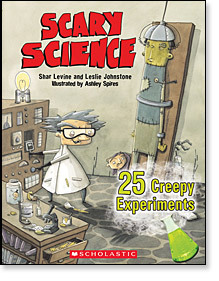 So when I received a review copy of Scary Science: 25 Creepy Experiments, I showed it to my 9 year-old daughter and 6 year-old son who quickly began leafing through it. My daughter wasn’t too thrilled with some of the experiment names such as Bubbling Alien Blood and Bouncing Eyes (Yuck!) but she was curious about the experiments and the science behind it. My son thought this book was so cool, and after looking through all 25 experiments we tried the Howling Spirits right away because we had the materials on hand and it was very easy to do. Since then we’ve tried some others to surprise Dad such as the message that appeared on the bathroom mirror after he took a shower even though the bathroom door was locked. Got you curious? This book is a science book that uses the theme of creepy, gross things. For example, there are experiments to make spiderwebs, shrunken heads, things that glow in the dark, festering ooze and zombie food. My kids are not particularly attracted to these things but the science aspect of it is fun and teaches children fascinating facts about chemical reactions and basic scientific principles. The book includes a list of Dos and Don’ts and a glossary of scientific terms, which I found helpful. Most, if not all experiments, require adult supervision but unless you are a very squeamish adult, you will enjoy doing these experiments with your children. Everyone loves a joker…right?! At Spiro Agnew Elementary School, fifth graders are at the top of the food chain. Kings of the jungle. The cream of the crop. In short, they rule the school. 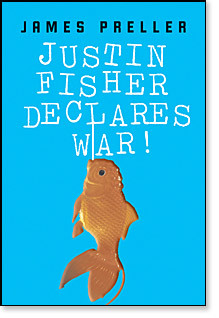 And class clown Justin Fisher-Fish-rules them all. Fish is the funniest kid in school. He's always playing pranks and goofing off. But this year not everyone is amused. What happens when the funniest kid in school isn't so funny anymore? My 9 year-old daughter looked at the cover of this book and told me she did not like it. (Neither did my 6 year-old son.) She wasn’t eager to read it either, but I convinced her to give it a try. We read about half-way and although I poured enthusiasm into the reading, when we got to the part where Justin, the main character, decides to swallow a live goldfish for money (it wasn’t even a dare) she told me to stop reading. I finished reading it later. Of course, I understood why this book didn’t interest her. “It’s gross, Mom! This is a boy’s book.” But it was more than that because we’ve read “boy” books before and enjoyed them. This book wasn’t as funny as I think it was meant to be mainly because I felt it contained adult humour. (Sarcasm, one-liners, jaded point-of-view) Justin Fisher did not think like a fifth grader but more like an older teenager who’d “been there, done that”. The characters seemed superficial. Justin had no friends, his teacher was tired of his antics and so were his classmates and how did Justin feel about all this? I’m not sure! He cared little about anything in particular, except to make sure he was making others laugh rather than have them laugh at him. (Now do you see why it did not appeal to my daughter?) I felt there was potential to explore some good themes, such as the need for attention and how to cope with being laughed at when in school. To be fair, I think this story would appeal to boys, especially those who like goofy antics and grossology. It’s a quick read with a story that takes place over a couple of weeks at school. Not much parental interaction or deep character development—but some comic scenes to entice even the most reluctant boy reader. The science experiment book sounds very interesting. My daughter wouldn't be interested in the gross-ness, but I think my son would be! As far as the other book goes, I can totally understand your daughter's reluctance to read it. I'm not sure it would appeal to me either! I think my grandson would LOVE these books! Thanks for posting about them!